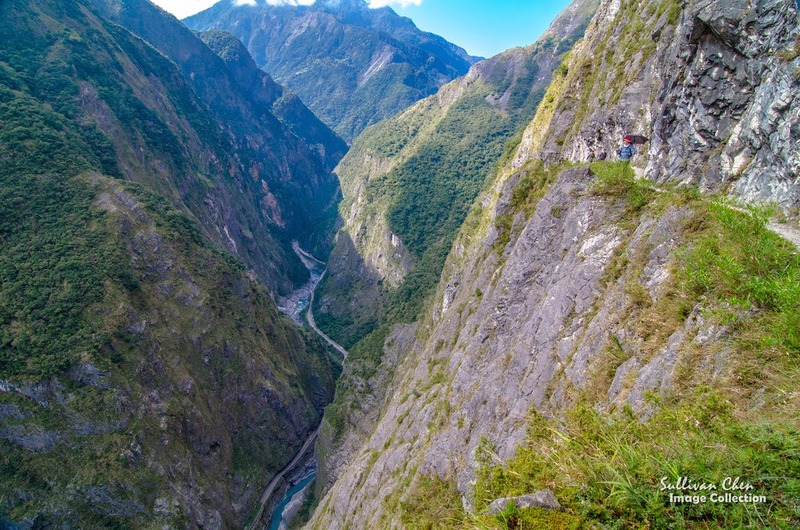 The Liwu River cuts through the Taroko Gorge and makes the gorge famous for it vertical valley. In additional to the gorgeous view in the gorge, Taroko are also renowned for its hiking trails. If you would like to enjoy an one-day trip in Taroko, you can find some useful information in the following indroduction. There are lots trekking trails in Taroko Gorge. It is a pity that visitor come to Taroko but only stay on the highway. The following 4 routes are most featured one-day trails. It is easy to have an one-day hiking in Taroko Gorge. There are bus stops at the entrance of these hiking trails. The hiking could be flexible. If you have only one hour, you could walk along Tunnel of Nine Turns. If you have 7 hours, you could hike along Zhuilu Trail. 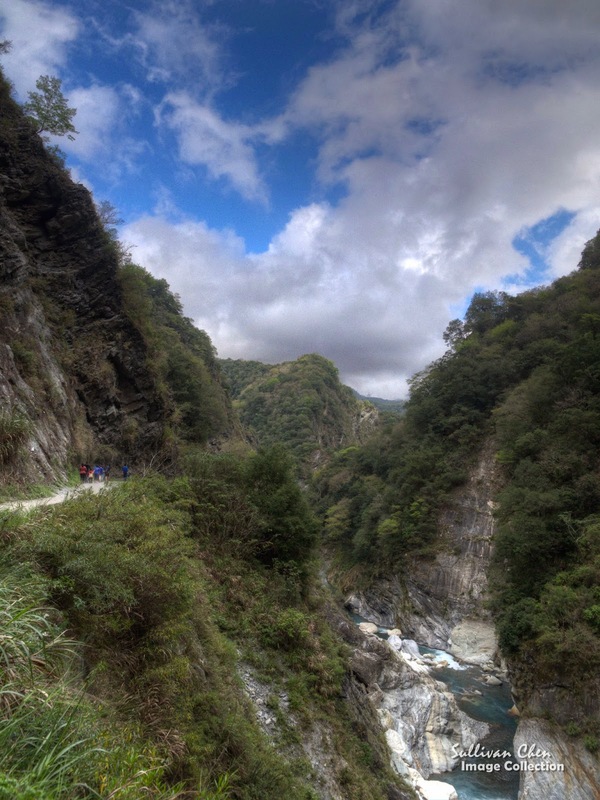 Google works with Taroko National Park to provide street view of these trails. You can see the view of these trails from the google maps in the bottom of this blog. Before you go hiking,please check the trail condition in order to make your hiking smoothly. Swallow Grotto Trail was the old road of HWY 8 which weaves in and out the cliff. . When you go along the pedestrian of the Tunnel of Nine Turns, you can see the green river and majestic river clearly. The river is like a sharp knife splitting out the gorge. Because of the vertical cliff, there may be falling rocks. In order to keep your safety, Taroko National Park provide free helmet at the entrance. Baiyang Trail was constructed by Taiwan Power Company in order to develop hydroelectric power in the 1970s. The entrance is located 500m west of Tienshiang Bus Stop. There are 7 tunnels along the trail. At the end of the trail is a waterfall curtain tunnel. 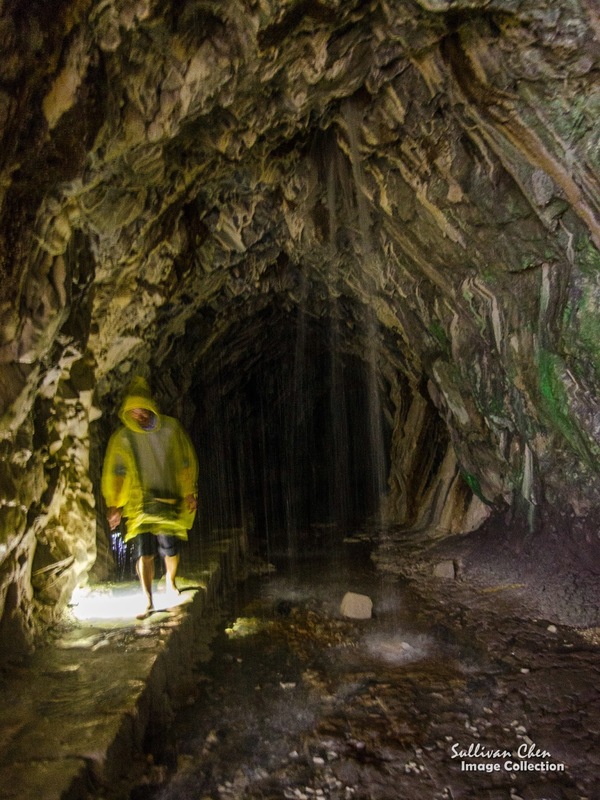 When you go through the waterfall curtain tunnel, you can see a see a green mountain view.There are raincoats provided by other visitors if you want to go in to the tunnel. However, you need to prepare a flashlight because the tunnel is dark. You can also prepare a pair of slipper. Shakadang trail is along Sakadang river, and Shakadang trail is closest to the river among 4 trails. 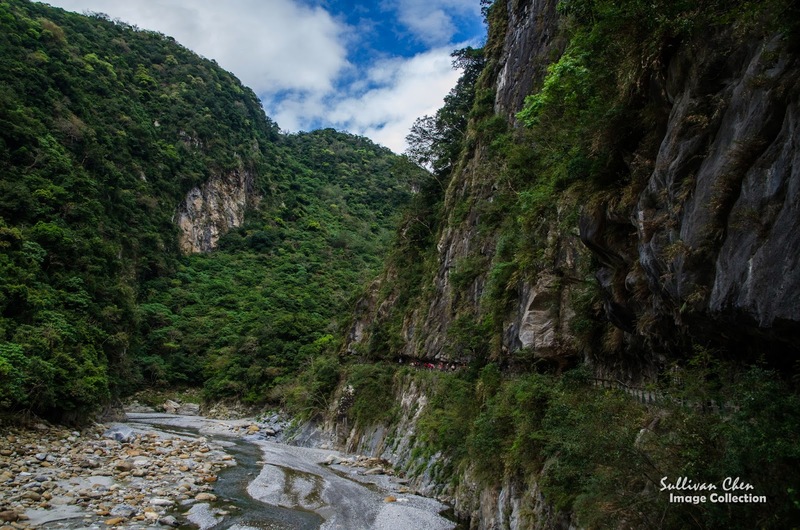 Therefore, you can see the clean water and beautiful rock marble folds.You can enter Sakadang Trail from the headquarter of Taroko National Park by going through the Sakadang Tunnel, or you can enter by taking the shuttle bus to Sakadang Bridge. Visitors can hike until 3D Cabin. Although the trail is almost flat, it takes about 4 hours to go and return. When you start you hike along Tunnel of Nine Turns from Swallow Grotto, you can find there is a line across the cliff in front of you if you look up. It looks like a road. However, it is hard to believe since you can not image how people constructed the road on marble cliff with hammers and drills over 100 year ago. The original trail, Hehuan Crossing Trail, started from Wushe to Taroko. In order to control the aborigines in the mountain area, Japanese widened the width of the trail from 30 cm to 1.5 m to carry cannon and military equipment. The construction was finished in 1917. You need to apply 2 kinds of permits if you want to hike along Zhuilu Old Trail. Ecological permit can be applied online if there are Taiwanese citizens hiking with you. If there is no Taiwanese citizen in your group, you can download the application form from the entrance application and apply by e-mail. It takes 1~3 working days to review your application. Be noted that the Emergency Contact Person should be a Taiwanese when you fill the application form. The capacity limit for the permit is 60 in weekdays and 96 in holidays. You can check the loading status when you apply . Another permit is issued by the policy department for security reason. The permit can by applied online as well if there are Taiwanese citizens hiking with you. If not , you can apply at the policy station which is next to the head quarter of Taroko National Park. It takes only a few minutes to fill the form in the policy station. Another hiking route start from Swallow Grotto and return from Cliff Police Station(3.1KM for one way). It takes about 5 hours to finish. You should enter Swallow Grotto between 7am~10am. For the transportation, since the train between Taipei and Hualien is hard to book,you can use combo ticket if you cannot book Taroko Express or Puyuma Express. If you want to stay one night in Taroko, you can choose the hotel in Tienshiang. Most of places of interests are between Tienshiag and Swallow Grotto and there is a nature hot spring under the river. If you want to hike Zhuilu Trail from Cimu Bridge to Swallow Grotto(10.3 KM), staying one night at Tienshiang will make it easier to arrive Cimu Bridge before 9 am. There is luxury Silk Place Taroko in Tienshian. There are also Tienshiang Catholic Church or Tienshiang Youth Activity Center if you have budget constrain. hi, thanks for sharing all the information and tips. I read about your combo tickets from another post. Is it still valid? (because the post was from last year). I want to go to Taroko George from Taipei. I read that Xincheng is the closest train station to the park, but I also read that there're not so many buses coming from there to Taroko. I rely 100% on public transport so I want to make sure of everything :D.
About the scenic trails in Taroko: no more tourist shuttle buses mean that I can't stop at the entrance of each trail but have to find other ways to get there, is it right? Also, what is your suggestion if I want to go from Taroko to Hehuashan? I want to hike the main peak or east peak but not sure which is more convenien. I also check that I dont need permits for these 2 mountain hiking trails. Last question :D: my last stop is Tainan. From Hehuanshan is it possible to go to Tainan by bus? Hualine Bus still run the shuttle bus. The bus interval is about 1 hour, You can find the time table from my another post. You can also take use of the itinerary suggest to catch up the shuttle bus from Xincheng Railway Station. 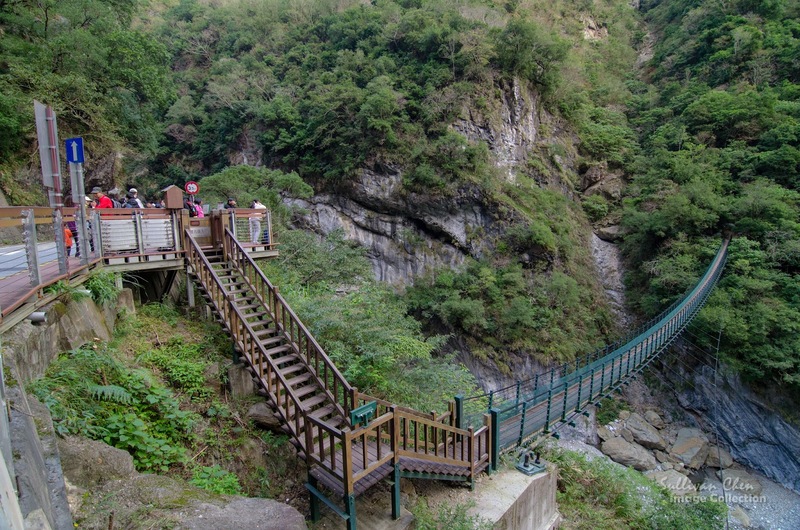 There are bus stops at each trail entrance, including Sakadang Bridge, Swallow Grotto and Tienshiang. 3. If you want to hike Hehaunshan, I suggest you take bus from Taichung and stay on night at Song Syue Lodge. Hi. Thanks for your informative blog on Taroko Gorge. My family & I are visiting Taiwan in Dec 2015 and planning to go to Taroko Gorge. I would like to know if the Combo ticket is still valid and shuttle bus still run from Xincheng Railway Station. But the timetable of train and shuttle bus may change. Please confirm again before your journey. You may have about 8 hours before sunset. If you don't feel tired, 8 hours is enough. Please refer to another blog" Booking Train Tickets to check timetable. Remember, if you want to go hiking, leave enough time for returning. Lots hikers and clear signs along those one-days trails mentioned above. Not difficult to trek alone. Remember to keep a eye on the time. We plan to go to Taroko Gorge via combo ticket. I would just like to confirm my understanding and ask a few questions. 2. Board bus from station and Alight at Luodong (end stop for all buses). 3. Take train, Luodong-Hualien Route, from Luodong Bus Station and alight at Xincheng (Taroko) Station. 4. Take local Hualien Bus using EasyCard and alight at the Swallow Grotto to go to the Tunnel of Nine Turns. 5. Follow/ Hike Swallow Grotto Trail (1400m) which will take about an hour. 6. Take local Hualien bus using EasyCard back to Xincheng Station. 7. Buy Combo Ticket from Xincheng Station. 8. Take train from Xincheng Station and alight at Luodong Station. 9. Take bus from Luodong Station back to Taipei. 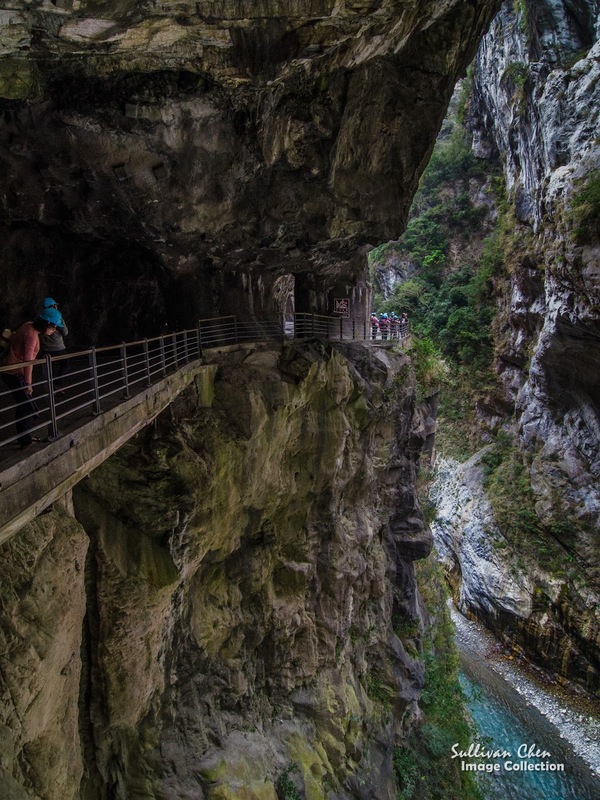 Besides the Swallow Grotto Trail, what else can we visit in Taroko Gorge that would fit in one day? We are 2 adults with kids ages 10, 13 and 14. Is the trail wet/ slippery? We're going first week of April. We've always wanted to go to Taroko but was hesitant until I saw your detailed blog. Just finished my NY trip. Sorry reply late. Your itinerary is ok. I know there are hiking guide of Zhuilu Trail and Private Taxi. Since your the public transportation there is simple, there may not be local tours that meet your needs. April is the best season for hiking.Not wet, not hot. The trail is under great maintenance and wont be slippery. Some other attractions for your reference. (2) Sakadang: Hiking along Sakadang River. The trail is flat. You dont need to walk all the trail. You can check the time of next bus and estimate the time you should return. (3) Baiyang Trail. Between Tianxiang bus stop and the entrance of Baiyan Trail, there is a river hot spring. Try the hot spring after hiking. Thank you so much Sullivan for the info. Hi Sullivan! I am a solo traveller planning to hike Taroko (including Zhuili Old Trail) in one day. Can i do so via public transport? If I want to hike from Swallow Grotto and end at the Zhuliu police station, is it possible for me to take a taxi back to Taroko visitor center? Hard to find a taxi but you can take bus to the center from the entrance of Zhuiliu train. I will be visiting Taipei with a friend in two months and we were looking to go do the Zhuiliu trail by ourselves. I did some research about how to get to Taroko National park and how the admission was working. I found your information about the combo tickets very easy to understand and it will be very useful to us. I also know that we need two permits to hike this trail, but my problem is that I do not know anybody that is Taiwanese that I could write in the "person of duty" section in the park entry permit. Any idea of how I could solve this problem or find someone to do that for me without having to pass through a day-trip organization that charges a lot? Try to contact your B&B host, especial the B&B in Hualien. Can you provide google map details (start and end points) for XiaoZhuilu (Little Zhuilu) trail? Hi, May I know is it possible to do Zhuiliu Old Trail in end January ? Thx in advance. You say that there are bus stops on both sides of the Swallow Grotto Trail tunnel. May I know what buses go to these stops please? Thanks! There are lots trail in Taroko. If you ask the trail listed above, Zhuilu is the only one that requires permits. hey! thanks for writing this. 1)As I am planning to bring my family to Taroko during CNY (17/2), i heard that road traffic can be pretty bad. So, in this case, do you still recommend combo instead of train to Hualien? 2)I was also thinking, if i just choose to hike a particular trail (e.g swallow grotto/jhuliu), the one day pass is not necessary as I could easily take a taxi using NT1200 one-way)? 3) is swallow grotto more like walking on a tar road instead of nature mud trail? 1) Combo ticket is a backup alternative. Try to book train tickets first. 2) But you could easily take the one-day bus using NTD 250. If fact, you you choose a trail to hike, the round bus ticket is around NTD100. 3) Grotto trail is a tar road. thanks! for the combo method, do you know if there will be any schedule changes for the train and bus? Also, can you confirm that this method can ONLY be done at the counter, and NOT in advance, even during CNY? cause i am worried, it will be gone when i reach the counter at 6am to purchase. thanks! Also, is it possible for people to go straight to the counter and buy the combo ticket (return) in advance? Or it is only limited to be bought on that day? Since the tickets are non-reserved ticket, prebooking is redundant. The counter only sell the combo tickets for the same day. The tickets are unlimited issued and not many people are waiting in the queue cause most people use easycard. I have used combo tickets for dozens times, no problem all. Ok thanks. But i am concerned that if i have a specific time to get onto capital bus (as early as 0625am), then people can ONLY buy it at 6am in the morning on the same day? The timetable is almost correct. Most people use easycard/ipass as city bus. They don't need to buy the ticket. Combo tickets is a special ticket. Only tiny part of people buy combo tickets. 1. Is the combo ticket from Hualien-Taipei only available in the Hualien station? It's not available in Xincheng station for example? 2. If I buy a combo ticket from Hualien station to take me back to Taipei but wanted to drop by Chongde Station first to visit Quingshi Cliff, I should buy a separate regular ticket from Hualien-Chongde, right? And use the combo ticket from Chonge onwards? Bring a flashlight with you. Cars drive so fast.There is also a tunnel before the observatory platfor. Have you choose "foreign country"?